This was such a fun pillow to make, I tried to think what colors would be in Marie,s boudoir, I thought gold, in her portraits she was often in blue, and every girlie girl loves pink, lace, feathers and flowers. So that's how it began. I had no finished vision or actual object to go by so I tried to make a woman with a beautiful multi layered gown with lost of lace, ribbon and details. The big hat with the feathers was a must, I had to dye white feathers with stamping ink to get the blue and lavender colors. 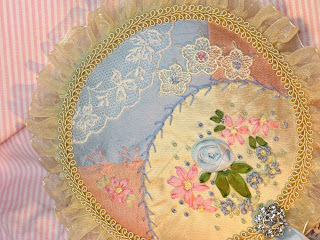 The ribbon flowers are silk hand made by me, and the pink trim is dupioni silk. I didn't give her a face and it adds a bit of mystery as to who she really is. The bouffant gown has two layers of lace from my vintage stash, with a white petticoat underneath. The gown had to be silk, and it is silk dupioni the ruffle around the opening of the gown is cream ruffled ribbon, with tiny hand dyed lace flowers added along each side.I thought the rhinestone button at the waist would add a bit of sparkle. The pink gathering on either side of the top of the gown is pink bias dupioni silk ribbon, it was a find at a antique stall. I will list this on my Etsy site. I am so in love with this mirror, I can't even believe I actually made it. 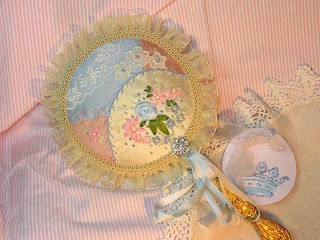 It is constructed on a vintage mirror and would be so lovely on a fancy vanity. The colors just came together so well, and the free hand silk ribbon embroidery turned out way better than I thought it was going to. I used things from my stash to make this charmer, using vintage where I could. One thing I learned was how to use the rufflier on my sewing machine, my sewing machine scares me because it can do so much and I am not good with computers. But I figured out the rufflier and have been ruffling every thing from cloth, ribbon, to crepe paper, it works great. This is a closer view, I am disappointed in the picture of the vintage rhinestone button I used, it is so shinny but the flash from the camera took all the shine away. It was so much fun making this mirror, and I am always inspired by the Marie Antoinette era, such opulence and over abundance but such beauty as well.